The long summer rains have been good to Everest’s Khumbu Valley and the people are joyful as they enjoy the festivities and surpluses of the harvest season. It is October and the rains have come to an end leaving behind them a sea of green. Fat and healthy yaks carry loads of fresh produce and trekking gear up and down the trails with little effort. Excitement and anticipation are in the air as the seasonal trekkers arrive at the Lukla airport and begin their migration towards Namche – the Khumbu Valley’s center of commerce and activity. 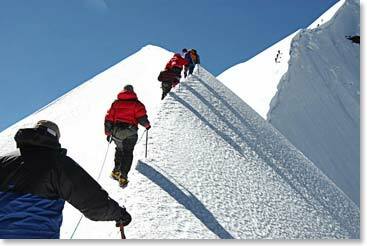 October and November are the busiest months for trekking in Nepal, and rightfully so. The weather is fantastic, the scenery is unmatched, and the general mood of the valley is festive. While some may worry the business of the season could detract from the experience, most people who have trekked in the fall would argue the contrary. Trekkers and locals alike enjoy the camaraderie of the fall season and even the busiest of times in the Khumbu are not that busy. You will find plenty of time for solitude and reflection, especially because we stay in small, quiet, and friendly lodges, travel with our own cooks, and take you to some of favorite places off the well-trodden paths. With 25 years of experience in the Everest Region, Berg Adventures offers the best there is any time of year. 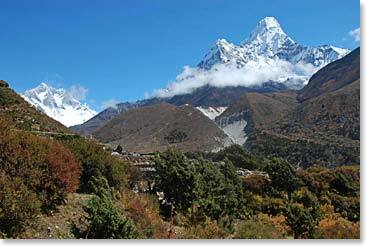 To learn more, visit the Everest Base Camp Trek home page or call our office at 403-609-4148. Read about past trips in our Everest Base Camp dispatch archives. 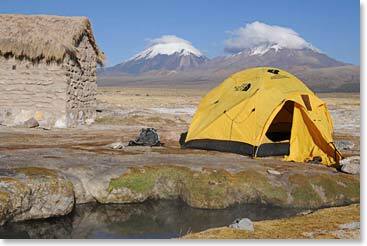 Or follow along as we trek next month! Once our adventure begins we will post dispatches here.